Vibram 5 Fingers: Pros and Cons and do they really work? Anybody seen those weird shoes with the toes?! On the subway, in the park, shopping in SOHO, in the restaurant, they are everywhere! This new craze in fitness footwear is growing exponentially. The real question is, are they practical, efficient, or just a fashion fad? Vibram 5 Fingers were created to simulate a barefoot running or fitness experience. These shoes come in a variety of styles, all geared towards a different fitness activity. The Bikila model for instance is specifically for running. They have a built up arch to prevent pronation, strategically places traction for heel and forefoot striking as well as antimicrobial agents in the fabric to prevent odor from all the places you may be running. Research as shown that the act of barefoot physical activity is a natural way of movement and should be embraced. On the other hand, medical research has found that with the aid of properly fit footwear, such as a stability running shoe, soccer cleats or even pointe shoe, one can enhance the effects of physical activity. Many have suggested that the Vibrams cause the increase of shin splints and back issues due to its inherent lack of support. One could argue that dancers dance barefoot or with a thin slipper and with proper training avoid injury. So it really boils down to your own personal decision. Take the risks, love the look or forgo the funny toes and stick to your trusty joggers. What do you think? Author Smart WorkoutPosted on April 24, 2012 June 12, 2017 Categories Health HelpLeave a comment on Vibram 5 Fingers: Pros and Cons and do they really work? Haven’t we all admired our First Lady’s beautifully sculpted arms? You can bet Michelle Obama does quite a few tricep exercises! The triceps are muscles located in the back of the arm, and are responsible for flexing your elbows. This month we are featuring the Triceps as our Body part of the month, as we have had many clients coming in asking for Michelle Obama arms. Here are a few quick and results oriented exercises you can do at home the gym or even at the office! Place your hands on the edge of the seat of any sturdy chair. Walk your legs out until your torso is in a flat table top position. Bend at the elbows and dip down towards the ground and press up. 3 set of 10 repetitions once a day should be sufficient. 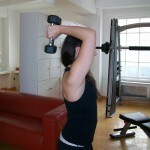 At the gym, you can always grab free weights or a kettle bell and launch into the standard tricep press as well. Arms extended straight up towards the ceiling behind the head. 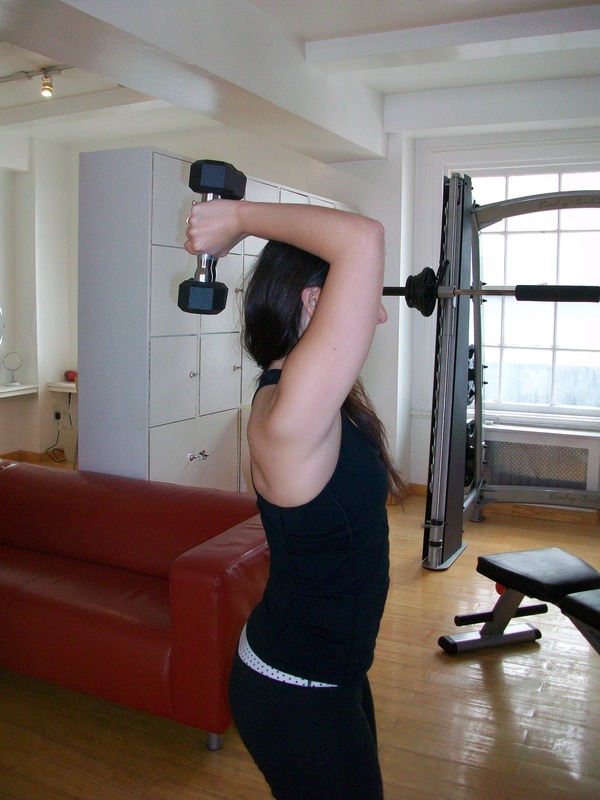 Bending at the elbows allow the weights to lower towards the ground and then press back up towards the ceiling. Keep up with these simple exercises and you’ll be waving to your friends with confidence!